Anchoring in NLP is a core technique. As the basis of so many larger processes, getting very skilled at anchoring is work that will be so very worth it. You can use anchoring to maintain a state, to elicit a resourceful state, to eliminate unwanted reactions, and as a part of so many other processes. It really is a core technique, without which, I’m not sure you can effectively practice NLP. As NLP practitioners, whether certified or not, our goal is to be as effective as possible in our practice. We want to effect change as quickly, efficiently and permanently as possible. Whether we use NLP in our personal or professional lives, as a coach or not, our ability to elicit and maintain states, both in ourselves and others, is one of the primary keys to our success. 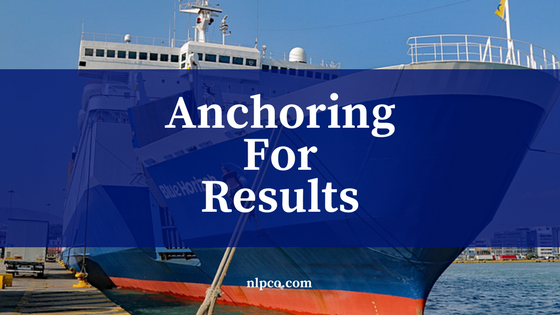 While a lot has been written about anchoring, there is still more to cover. You may or may not know, anchoring is similar to Pavlov’s response. You remember…the guy who made dogs salivate by ringing a bell. The concepts are quite similar. Pavlov’s response is about the association of an external stimulus (the bell) to an internal response (salivating). Anchoring is a bit different in that it is often connecting internal stimulus to an internal response. Ok, enough talk about dogs and salivating. 🙂 Let’s get into the real world application of anchors, how and why we use them, how to choose which anchors to use, and a couple of ninja uses for anchors in coaching and in life. Before we cover all of this, let’s make sure we are on the same page in terms of what an anchor is. We use anchors in NLP to anchor a particular “state,” otherwise known as a feeling, an emotional state. So, when you want to get to and stay in a particular emotional state, an anchor is a great way to achieve that. Now, let’s talk about the stimulus. The stimulus is what elicits the state. So, it’s the internal or external “thing” that bring up and/or maintains the emotional state you’re going for. Let’s look at an example or two. Have you ever gone back to the area you grew up in? Maybe taken a drive by your school or childhood home? 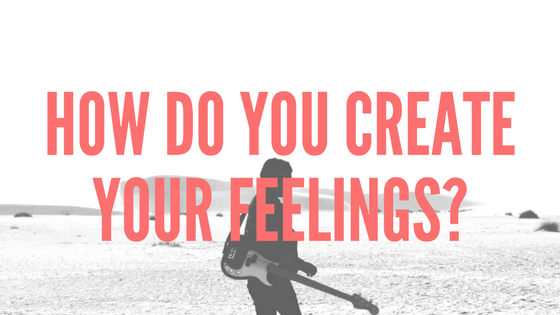 If you have, have you experienced that moment when a rush of emotions takes over? Or maybe you hear a song that has a lot of meaning to you. Or a particular perfume. Any time you have one of those experience and you automatically experience an emotion, that is likely an anchor at work. Anchors are active in our lives every day. Very simply, they are things, something we experience through one of our senses, that fire off an emotion. Like anything else, anchoring first requires having a clear outcome. What state do you want to elicit, when do you want to be able to elicit it, and in what environment do you want to elicit it. Once you are clear on that you can begin to take the next steps. To make sure you are setting a strong and solid anchor, there are a few things you should make sure your anchor has. Make sure the state you are working with is both intense and pure. What do I mean by that? You don’t want to anchor anything to a mild response, you won’t really know if you are able to elicit it on command. Make sure you are using something intense. Also, make sure you are anchoring to a pure response…if you, or the person you’re working with, is feeling multiple emotions you will anchor all of those, and elicit all of them in the future. Use an anchor, or a stimulus, that is unique. The sound of a closing door, for instance, is very common so it ends up being ineffective as an anchor. Try something you’re not likely to encounter. A touch on a specific knuckle on a specific finger, a rare song, a unique glance or keyword that you won’t be likely to hear outside of the anchor process. Time your anchor and response to be immediate. You want the stimulus to happen as the response is occurring. Any gap and you could inadvertently anchor a different state than you intend to. Be aware of the environment and any pieces of your environment that could impact your anchor. They can serve to water down, even completely change, the anchor and the state you are wanting to elicit. One question that comes up fairly frequently is what kind of anchor can we use. Are some anchors better than others? How do you know when to use what anchor? What if I can’t think of any great anchors to use? If you are wondering what kinds of anchors to use, stay tuned, because there are a lot of ideas here for you. Anchors are something that have been in use for a long time. When I was in college, studying Psychology, we had a professor who was…a character. I remember before our midterm he was quite proud of himself as he shared some of his study tips. Take great notes and review them all. The midterm questions would come directly from the reading and class lectures, so if our notes were good we already had all the answers. Don’t overthink things. The very fact that we were still in his class meant we knew the material. If we didn’t do well, it was simply because we got inside our own heads too much. We knew this stuff, and we would pass if we simply relaxed and focused. If we were drunk while studying, come to the midterm drunk. It would help us to be in the same state we were when we studied. Yes, I am not kidding. These were his tips! I’ve never really been a big drinker, but I must say, some of the students in that class took him at his word! The midterm was fascinating! Anyway, anchors can really be anything. Something in a room, a touch, a sound, a smell, a space on a floor…it is simply something we can associate with a feeling in someone’s mind. Choosing an anchor in your preferred submodality is very powerful. People tend to be very sensitive to these cues and associate easily and strongly in their preferred submodality. Using an anchor in a different submodality can be a sneaky way of creating some of the most powerful anchors you can create. These are called covert anchors. To read more about anchoring, check out these articles.